Nissan sees the Kicks as another gateway to its existing crossover lineup. LOS ANGELES -- Nissan Motor Co., looking to further capitalize on North America's love for light trucks, is once again expanding its crossover lineup, this time with a new gateway for Canada and the United States. The 2018 Kicks, a Versa-sized subcompact, extends Nissan's crossover lineup that previously started with the subcompact Juke, which features a lower, hatchback like profile compared with the Kicks. With the Kicks, Nissan will join Fiat -- 500X and 500L -- with two entries in the burgeoning subcompact crossover segment. 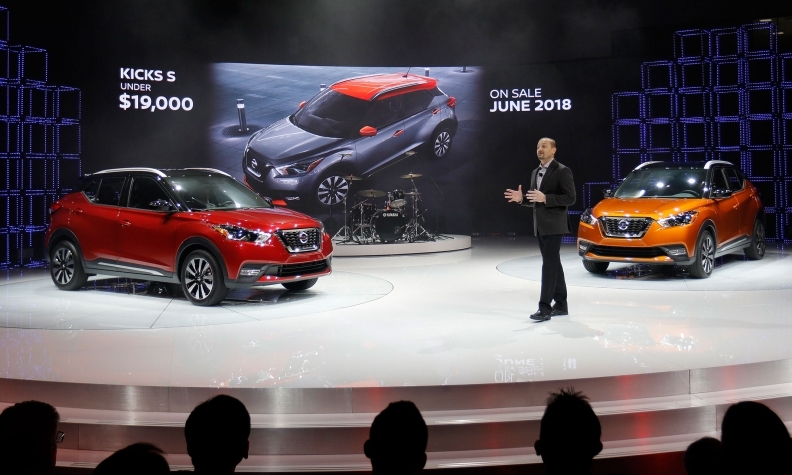 The Juke was never intended to appeal to the lower-end mass market in North America, but the Kicks, unveiled here Wednesday, will, Nissan officials say. Nissan sees the Kicks as another gateway to its existing crossover lineup, which includes the Qashqai added for the 2017 model year. The Kicks is designed for the needs of younger singles or couples, Nissan says. Kicks is designed to fit the needs of singles or couples looking for expressive styling, personal technology, smart functionality and advanced safety features," Steve Rhind, director of marketing for Nissan Canada, said in a statement. 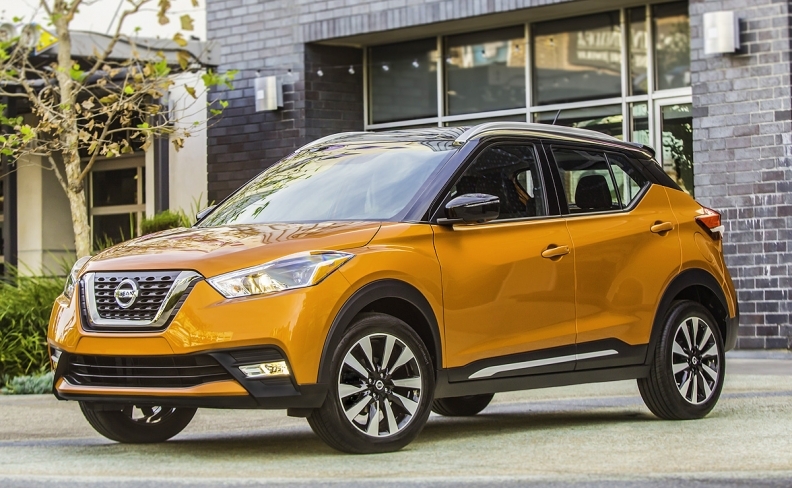 "This emerging CUV class is exploding with new entries for a very good reason -- the combination of flexible utility and high value is ideal for active, urban new vehicle buyers," Dan Mohnke, Nissan's senior vice president of U.S. sales, marketing and operations said in his own statement. The 2018 Kicks, a Versa-sized subcompact, extends Nissan's crossover lineup that previously started with the subcompact Juke. Nissan's one-two compact crossover punch with the Rogue and Qashqai has been a hit for the automaker. Through October, Nissan Canada has sold 36,663 units of the Rogue -- a gain of 10.4 per cent -- by far the strongest-selling nameplates in the brand's lineup. Nissan Canada has sold 6,450 Qasqais through the first 10 months of 2017. The Kicks, which features Nissan's prominent Vmotion grille, traces its design cues to the Kicks Concept that was shown at the 2014 Sao Paulo Motor Show. The Kicks went on sale in South America in 2016. Nissan will offer the front-wheel drive only subcompact in five different colours and, to further strengthen the Kicks' youthful appearance, five two-tone combinations. The U.S. version gets seven colours to choose from. Power will come from a 1.6-liter, 4-cylinder engine that produces 125 hp and 115 pound-feet of torque, Nissan said. The Kicks is 169.1 inches long with a wheelbase of 103.1 inches. It has a ground clearance of seven inches. For perspective, the Qashqai, which is a little bit smaller than the Rogue, has a total length of 172.4 inches and a wheelbase of 104.2 inches. Automatic emergency braking with forward collision warning is standard across the Kicks' three trims lines: S, SV and SR. The SR line get standard blind spot warning and rear cross traffic alert, Nissan Canada said. The Kicks' interior features Nissan's "gliding wing" dashboard display, which houses a 7-inch infotainment system. Three USB ports are standard while Apple CarPlay and Android Auto capability is available on the SV and SR trims. The SR premium package adds a Bose sound system that is highlighted by a pair of speakers inserted in the driver's seat headrest, a class exclusive feature, Nissan said. The Kicks is set to land at dealerships in June. Pricing was not announced.